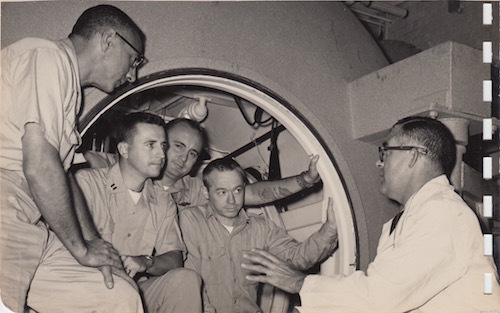 Sealab tells the mostly forgotten story of the U.S. Navy’s daring program that tested the limits of human endurance, revolutionized the way humans explored the ocean and laid the groundwork for undersea military missions to come. Based in part on the book SEALAB: America’s Forgotten Quest to Live and Work on the Ocean Floor by Ben Hellwarth, the film was written and directed by Stephen Ives, produced by Amanda Pollak, and executive produced by Mark Samels. Sealab premieres on AMERICAN EXPERIENCE Tuesday, February 12, 2019, 9:00-10:00 p.m. ET on WOUB. The challenge was to counteract the danger from the effects of atmospheric pressure underwater which compresses air – the further a diver descends, the more the air molecules in his lungs become concentrated. Under the increasing pressure, the air molecules are absorbed into the blood and tissues, but too much oxygen becomes toxic and causes convulsions; too much nitrogen causes a woozy fog that can be deadly. Equally dangerous are the problems compressed air can create as the diver resurfaces: ascending too quickly releases the gas as bubbles, causing the crippling and often fatal cramps known as “the bends.” Sealab would pioneer what is known as “saturation diving,” which would allow divers to remain undersea — and emerge unscathed — for more extended periods of time. In 1963, Cold War tensions were high, and the Navy was determined to match the Soviets’ capability in submarine warfare. When one of America’s newest atomic submarines, the U.S.S. Thresher, developed mechanical problems and sank in more than 8,000 feet of water, its hull crushed by the immense pressure, Bond’s work became a top priority. Within a year, Sealab I, manned by five aquanauts including Carpenter, was lowered to the ocean floor off Bermuda. After ten days, the men emerged safe and sound. They would next test Sealab in a far more inhospitable domain – one that would push the men to the very edge of human endurance. Sealab II consisted of three teams of aquanauts each taking turns living on the ocean floor for 15 days. They set up weather stations, tested new electrically heated wetsuits, and attempted to salvage the sunken fuselage of a fighter jet. But the work was exhausting, disorienting and dangerous. When Sealab II finally resurfaced on October 11, 1965, it had been continuously staffed for 45 days, including Scott Carpenter’s record stay of 30 days. As Cold War tensions heightened, the game of nuclear brinksmanship continued in the ocean with saturation divers increasingly playing a part in espionage. But when Sealab III was lowered to the sea floor off the coast of San Clemente, California on February 15, 1969, there were immediately problems, and aquanaut Berry Cannon perished. Although the Sealab program was subsequently suspended and completely shut down in 1970, the lessons learned were used in numerous covert Naval operations for years to come. 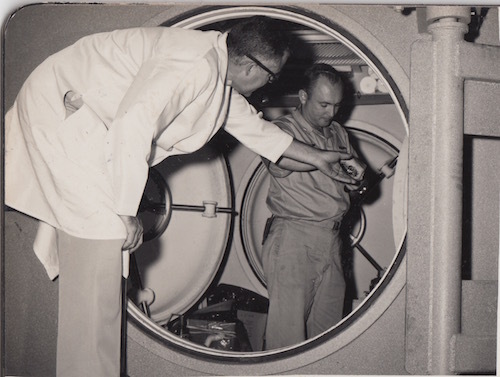 Robert A. Barth is the only diver to have played a central role in every phase of the U.S. Navy Sealab program, from the first experimental saturation dives in hyperbaric chambers in the early 1960s to the first dives at a depth of more than 600 feet off the Southern California coast to set up the third and final Sealab habitat in early 1969. Richard Blackburn had a long career as a Navy diver and served as a saturation diver (aquanaut) to Team 1 on Sealab 3. 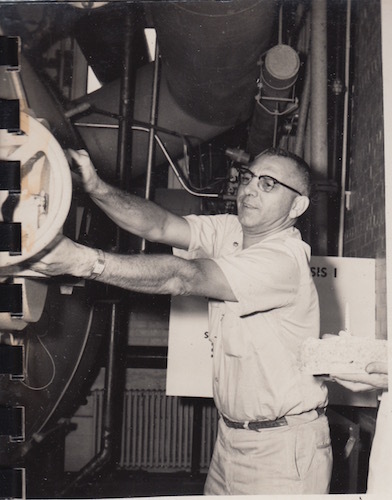 Bob Bornholdt was an aquanaut and team leader in the Navy’s Sealab program. In 1980 he was assigned as the Commanding Officer of the Navy Experimental Diving Unit in Panama City, Florida. Sylvia Earle is President and Chairman of Mission Blue/The Sylvia Earle Alliance. She is a National Geographic Society Explorer in Residence and is called Her Deepness by The New Yorker and The New York Times, a Living Legend by the Library of Congress, and First Hero for the Planet by Time Magazine. She is an oceanographer, explorer, author and lecturer with experience as a field research scientist, government official, and director for several corporate and non-profit organizations. Ben Hellwarth is a journalist and author of SEALAB: America’s Forgotten Quest to Live and Work on the Ocean Floor, the first book to tell the full story of the game-changing U.S. Navy project of the 1960s. Hellwarth is currently based in Los Angeles.